The aim of this article is to introduce the reader to Bzflags. 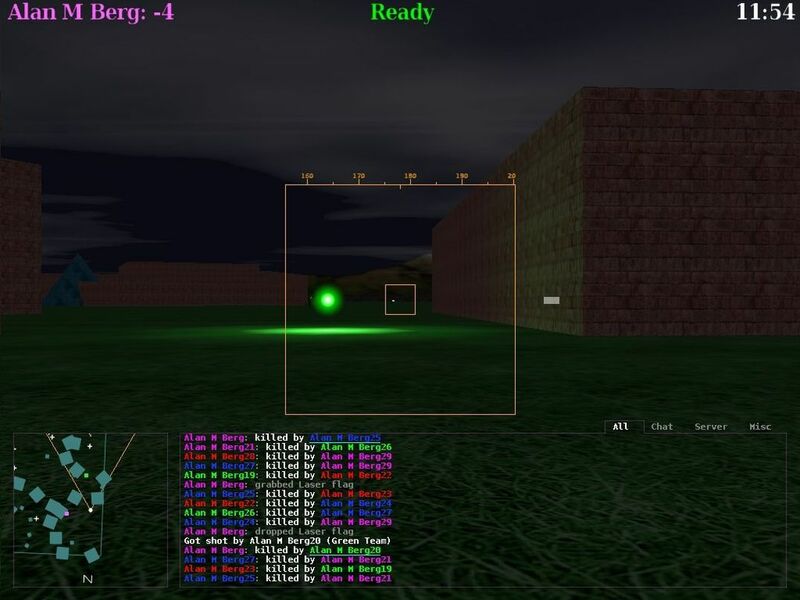 Bzflags is a free software multiplayer 3D tank game that is frantic, full of immediate action, with a kill or be killed emphasis. The game is best served in multiplayer mode where you can hunt in packs, fight to the last ounce while chatting. Instant violent fun, gratification for those of you that need to let off steam and clear your minds living for the moment. However, because of my cowardly disposition and weak trigger finger, not to mention my poor reaction times, I have once again hired in my ten-year-old son Nelson to test out the various parts of the game and pretend to the world that he is me. I will interview him later in this article and take online credit for his kill ratios. The name Bzflags is an abbreviation of Battle Zone Capture Flags. Named after, one assumes, Battlezone, a classic, vector-based arcade game that came out just after space invaders. Showing my age, I was addicted to Battlezone and never had quite enough pocket money to kill all the enemies my psyche required of me. I even ended up doing a paper round to pay for my addiction. Capturing the flag involves exactly that, one of your team members needs to ride over the enemy flag and then take the flag back to your rest zone. This is of course made more complex by the horde of charging tanks that wish to communicate with the flag capturer their physical respect. Yes, frantic, fast, and furious. If you don’t die ten times in any given game then you haven’t lived. Four teams play at any one time. Installation is straight forward for MS Windows users: you download the executable from Sourceforge and run it. For GNU/Linux users there are rpm packages available, and for Mac the equivalents. Pretending to be a stereotypical user, I downloaded Bzflag 2.04 onto my overloaded laptop running Windows XP home edition. Where, of course, BZFlag2.04 is replaced with which ever version number of the game you have installed. The solo option states that you are playing against yourself and 10 is the number of tanks that the computer controls. Note: The Bzflag server requires very little in terms of network bandwidth and other system resources such as CPU. However, the man page does warn about running the server under Windows 95 due to constraints within the operating system itself. Before going further I would recommend reading the help page. The page contains a list of keystrokes and their related functions. After reading the help, it is time to join a local game against your computer. Yes, the evil computer that you need to fight with every fibre of your patriotic being, the self same evil computer that has stolen those hidden pixels and corrupted many undisclosed binary files. I will have my revenge! Hum, back to reality. 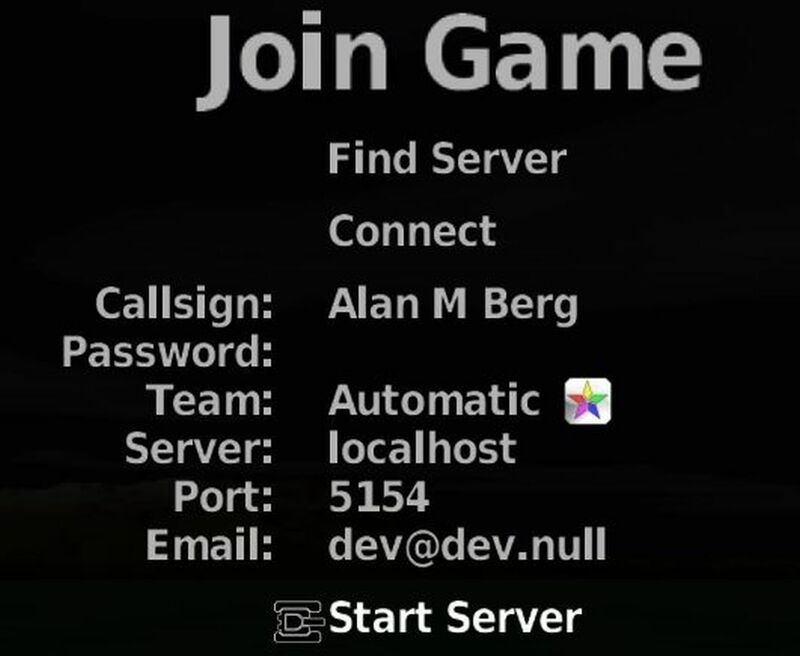 Back at the main options, select “Join Game”, making sure the server mentioned is localhost (see figure 1). Select start server: you will find yourself under the server configuration screen, figure 2. Feel free to modify the configuration options; the main ones of interest is the “Style”, which defines the type of game you will play. 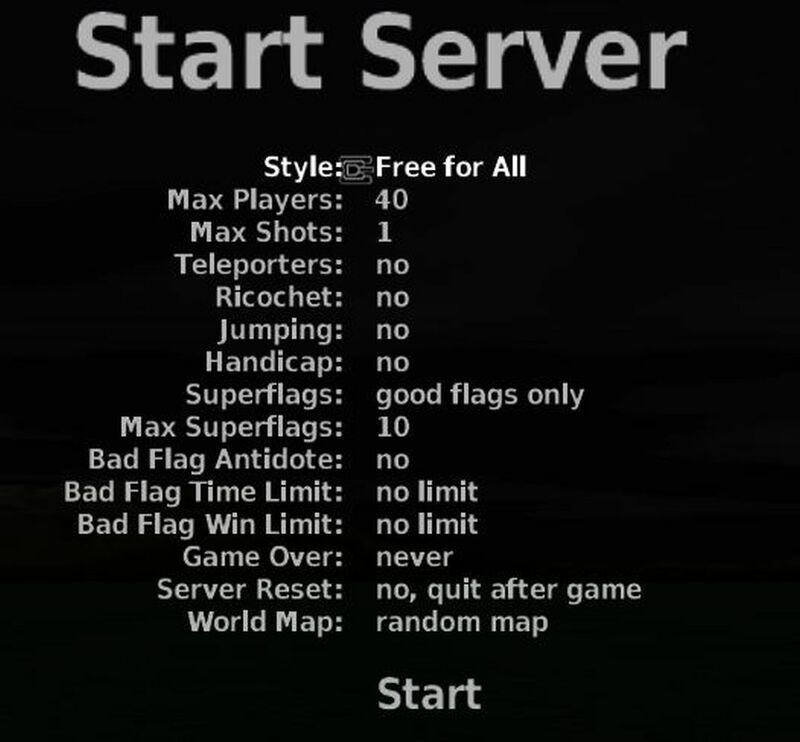 The three main styles are: “Killer Hunt”; “Free For All”; and, “Capture The Flag”. “Killer Hunt” is a simple game type, where one of the tanks is nominated as a rabbit. Every other tank has to try to kill the rabbit. Sounds a little like my average work day. In “Free For All” everyone is expected to shoot everyone. “Capture The Flag” involves team work. Four differently coloured teams try and capture the flag of one of the other three enemy teams and then tries desperately to bring the flag back to their base area. So much confusion occurs in this situation that it’s a wonder to behold and very enjoyable to be involved in. Once you have connected to the server of choice, you will find yourself in the middle of the action. If you’re a newbie, this can be a bit intimidating. You will see a console similar to that shown in figure 3. Notice the shell speeding towards you. If you dodge, you survive. If you blink, you are gone. If you are playing with a team it is good to know your team’s colour, which is indicated by the text (ready) at the top of the screen. To move you need to place your mouse in the outer box. If you place your mouse at the top of the outer box, you will move forwards. If you place your mouse in the centre you will stop, and if you place your mouse at the bottom of the box then you will move backwards. The further you put the cursor from the centre, the faster your tank will move. On some servers you may jump; this is achieved through pressing the tab key. It is considerably easier to dodge and move than it is to hit a target. Therefore, practicing your dodging ability should be your number one priority. Within each world there are numerous flags. By moving over a flag you may change the properties of your tank or the weapons the tanks uses. You may also drop a given flag and choose another. Chatting, or more accurately taunting, is achieved via the n (send to all) m (send to team mates only) key strokes. But, to be honest, I am too busy being a rabbit, even when I don’t have to be, to chat. Nelson somehow manages to multitask. Perhaps I should revert to playing bridge on the internet instead of damaging my tattered ego. So, did Bzflags pass the taste test of a ten-year-old psycho killer? Let us interview the young man and collect his always random thoughts. NB: Yes until I die. Normally dying doesn’t matter, but then I noticed that you score points on killing and dying. Dying is not a winning option. AB: What is the best part of the game for you? AB: What is the next best part of the game? AB: What is the worst part of the game? NB: Duh, dying. You should know. I’ve killed you often enough. AB: Any suggestions for the makers of the game? NB: Can you change the point system into a description of how good you are? AB: Please describe the best moment you have had playing the game? NB: When I beat the enemy team by capturing their flag. I had to run and dodge and I still managed to taunt them through the chat facility. It was like listening to 50 cent. Cheating online is bad. When I play first person shooters alone in the dark, I cheat. I play against the computer as a god. I just love blowing things up and watching the game react with ever increasing waves of stronger opponents. Within the online world, it is possible to cheat as well. For example Bzflags has given a lot of power to the client program which allows for a multitude of cheats. Cheating online potentially takes the pleasure away from your opponents. What is the point of becoming as good as you can be only to have yourself destroyed by Mr Invincible newbie? De-skilling online games via cheats diminishes the overall motivation of your fellow gamers. Good for development purposes, but bad for the general populous. Think about it. Don’t drink and drive, don’t cheat online. 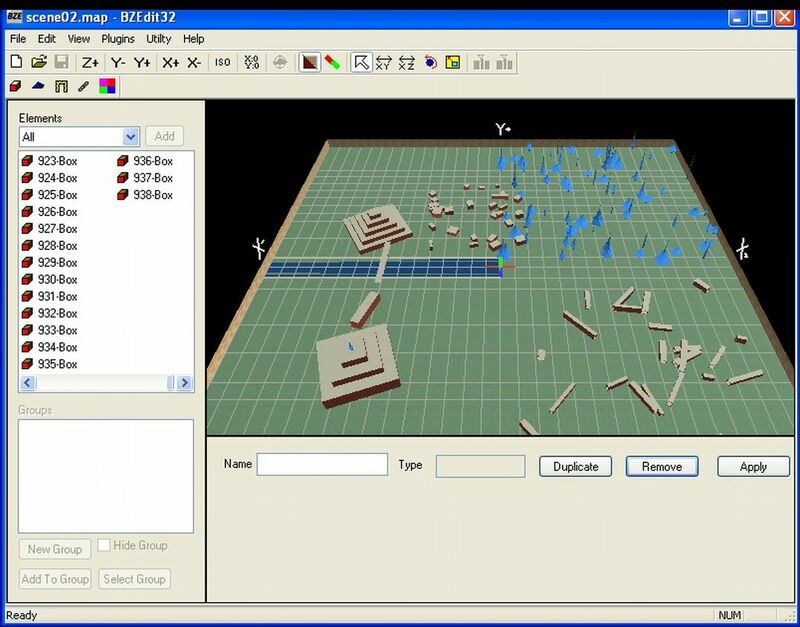 Figure 5 shows the clients rendering of the map that was shown in figure 4. Notice the rabbit (me) running like hell from a pursuing bot. I expect my son’s tank is hiding behind one of the trees; I felt his online breath down my neck. I had fun playing this game, my son more so. Of course, the graphics could be better and the range of options more diverse, but for shear frantic energy loss and immediate action Bzflags cannot be beaten. For those of you who own internet cafes or have regular LAN parties and wish to enhance your games section, setting your own protected server up takes relatively little effort. World making requires effort, but hey Rome wasn’t built in a day and you can always Google for the map efforts of others. Enjoy the game; prepare the coffee machine and teleport into worlds where nearly everything is deadly.